Your swimming pool definitely requires frequent cleaning, but if you buy a pool cover for it, you don’t need to clean it many times. You will have a great time being the owner of a pool cover that keeps dirt and debris out of your pool. But for your pool cover to work effectively, it needs the best pool cover reel. Having this reel comes in handy when setting up your cover on your pool. With just a simple unrolling, you will surely have your swimming pool cover in place. If you are having a hard time selecting the best one, don’t fear as we have looked at the top models on the market today. 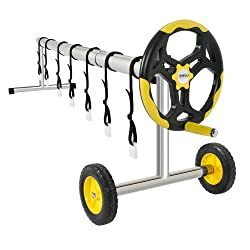 VINGLI Pool Cover Reel Set measures 18 ft. x 40 ft. and is one of the easiest reels when it comes to assembling and using. It features embedded strap link construction that makes pulling force more stable and bigger. Another feature of the reel is the telescopic tube that thwarts shaking when in use. And since it’s lifted, it works quite better when compared to other reels that rest on the surface. Actually, it offers superb balance, is large, and is easy to allow your cover to roll smoothly. Also, the reel is maintenance-free and doesn’t rust even when the weather is harsh. This is possible due to the three-section aluminum pipe construction that makes it hard to droop. The best thing, it fits well in all shapes of the pool and it is ideal for 6 ft. to 18 ft. wide inground pools. The Aqua Splash 16 ft. pool cover reel features a 3-way end construction that allows for mobility, fence mounting, and stationary placement. Hence, you can easily install it in any place you want within minutes. It also comes with wide-track bearings that make rolling and turning easy. Furthermore, it comes with convenient handles that are located at both ends of the reel to provide an easy time when rolling your cover. Another feature of the reel is the durable elements that resist corrosion, ensuring that it will last for years. Its telescoping tubes come with a rib-locking construction that prevents sagging when rolling your cover. You will also be excited to learn that a blanket attachment and complete hardware kit are provided. And the reel is made to be used with 8mil–12 mil blankets. 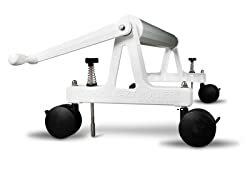 This cover reel from Solar-Lakes.com is a solar battery powered product that rolls up your ¼ inches thick blanket from your 18 ft. x 36 ft. in about one minute. This ensures that you get more time to enjoy your pool as opposed to removing the cover. The product is grid independent. Hence, you don’t need to use DC/AC charger to close/open your rectangular pool two or three times a day. If there are three days of sunshine, and if your solar panel is in a good place, you can rest assured your reel will work for the whole week. 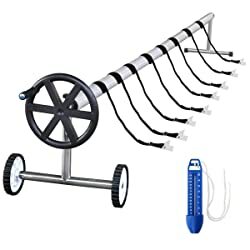 Included in your package are the 21 ft. x 3 inches aluminum tubes, two handheld remote controllers, the motorized unit, DC/AC indoor battery charger, and other things. Furthermore, you get a one year warranty that covers against any issue that might arise due to manufacturer’s cause. The SKY1768 from Best Choice Products is made with long-lasting stainless steel legs as well as lightweight aluminum to ensure that it is durable. Additionally, it is made of plastic wheels and a plastic handle to ensure that it remains rust-free. 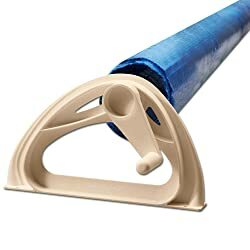 Hand crack construction makes it easy for only one individual to smoothly roll the pool cover and is designed with Velcro accessory points. So, you don’t need to both other people when you want to roll up your pool cover. Moreover, it is one of the easiest to mover around the reel, thanks to its huge, plastic, treaded tires. And that’s not all, it’s easy to assemble and constructed of a lightweight material to make it easy to store. It is a great reel that will offer value for your money. This unit was specifically designed for in-ground swimming pools of up to 20 ft. wide. It is made of firm die-cast aluminum with baked enamel surface for durability and quality. Actually, the finish is rust-resistance and offers it an attractive look. The cover features 3-inch, 12 sided anodized tubing that adds strength in order to prevent sagging. What that means is that you can roll up your cover without the need of help from other people. 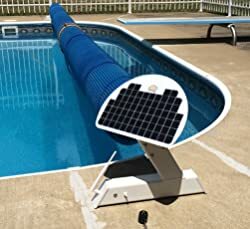 Comes in handy, the unit is well raised to about 13 inches from the surface to ensure that your pool cover doesn’t touch the surface when rolling it. And the package includes extra-large crank-handle, all hardware, solar blanket attachment, and 4 inches castor set. Moreover, the installation process is very easy and you can control it with just one hand. This is an ergonomically made reel that helps in unrolling and rolling of your pool cover. Hence, with this unit, you can rest assured that you will enjoy all the benefits of covering your swimming pool. Its frame is made of stainless steel material and comes with heavy-duty wheels that make it easier to move around. Also, the wheels have huge treaded tires that make it easier to maneuver around while rolling your cover. 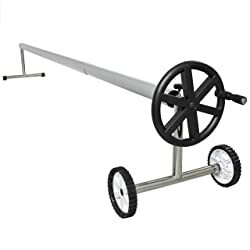 Best for in-ground pools, the reel works perfectly well for pools of up to 20 ft. x 40 ft. and offers a 3¼ inches diameter tubing for rolling your cover. Last but not least is the Nova Microdermabrasion Pool Cover Reel. It boats of seven-section thick aluminum pipe that offers it a strong construction. The reel is ideal for 17.5 ft. to 21 ft. pools and has a diameter of 3¼ inches tubing. 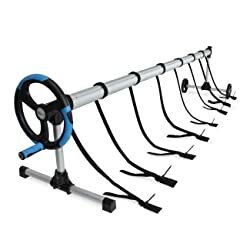 And it comes with three useful poles which enable the reel to be perfect for a swimming pool of 24 ft. wide. With this reel, you can enjoy the benefits of covering your pool and have an easy time when swimming. It is an affordable product that will offer value for your money. Construction – This includes the material used and the way the reel is made. Go for a product with aluminum, strong plastic, and stainless steel material. Assembly process – It should be easy to allow for one person to assemble it. Price – Price often determines the quality of the product. Ease of use – It should be easy to use. Brand – Get a reel from a reputable company. Q: Why should I get a cover reel? A: This system helps you to enjoy the benefits of covering your pool and make it easier to cover your pool. All the cover reels we have looked above are of top quality. Of important, the best pool cover reel should work for you and be easy to assemble and use.